Pipe production, coating and cathodic protection companies fall within the service, supply and manufacturing sector of the oil and gas industry. Companies within the pipeline sector operate the pipelines that crisscross Canada and the US. Most of the pipes used in the oil and gas industry are steel. And everyone knows that metals like steel can eventually corrode from repeated exposure to moisture from water and air. This explains the concern some people have for using underground pipelines to transport oil and gas across North America. Industry has long recognized that pipeline corrosion is a critical issue and thus has developed first-class technologies to address it. To avoid corrosion, pipes are protected in two main ways. The first is applying a coating to the pipe when it’s being manufactured. An epoxy coating, such as Fusion Bonded Epoxy (FBE), is often used because it adheres well to the pipe, thereby resisting corrosion for the life of the pipeline. Epoxy can be applied in various thicknesses as required. Some pipes are coated with more than one layer, for example with epoxy plus a powder-based polyethylene top coat. This provides even stronger pipe protection during transportation, installation and operation and/or for specific uses such as road and river crossings. This is shown in the image at the top right. 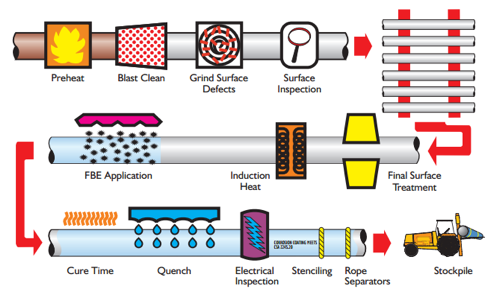 Whether it’s one layer of protection or many, pipe coating is a multi-step process, including heating, cleaning, grinding, applying, curing, quenching, inspecting and labelling. The product application process at right summarizes how it’s done. Pipe coating and cathodic protection work together to protect pipelines from corrosion in all types of environments. The second type of pipeline treatment is cathodic protection. According to the Canadian Energy Pipelines Association’s fact sheet on corrosion: “Cathodic protection is a technique used to control the corrosion of a metal surface by using another piece of metal to draw corrosion away from the pipe through the use of a carefully calibrated electrical current.” Learn more about cathodic protection in the April 2012 issue of PatchWorks. Companies continue to invest in research and innovation in order to develop the most effective anti-corrosion coatings that work in conjunction with cathodic protection to keep pipelines from external corrosion. Internal corrosion is rare, because the pipes have so much product flowing through them. However, scrapers, like round wire brushes, are used as needed to clean the inside walls of pipelines to remove any buildup, which helps protect the pipes from corrosion. Pipelines are also monitored for internal corrosion or cracks with “pigs”. For more on pigging, read the May 2012 issue of PatchWorks.